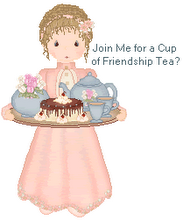 Friendship Tea: Can you believe it is already February? Can you believe it is already February? 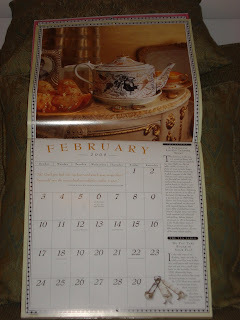 This morning I turned the page in my COLLECTIBLE TEAPOT & TEA CALENDAR 2008 to the month of February. This month the beautiful teapot in the photo is an 1805 Miles Mason oval decorated with black and gold. The February page also tells a little about the history of sugar and sugar tongs. This calendar by Joni Miller with photography by Martin Brigdale is more than a calendar with beautiful photos of teapots. It is also a resource of tea information and tea quotes. In addition, twelve bonus postcards are included in the package. The 2008 calendar is special to me because it is a gift from Linda B., a Kentucky lady, who lives in Washington, DC. "Tea is mankind's oldest established most loved beverage because a cup of tea is good to the taste and because it makes life more pleasant by the feeling of well-being that is gives to mind and body."